8.6 / 10 based on 6 reviews. Of the 6 people who reviewed this product 100% would recommend it. 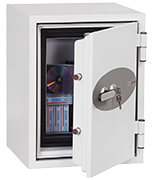 Pros: Nice secure safe with a good size Cons: Smaller than expected, we were hoping for an A4 file to stand up but it is smaller insie. Easy to use, locks feel secure and the inner lining adds extra fire-proofing. Great little safe. This product has 6 reviews.